Cinemablographer: What Were They Smoking? Alexis Martin in Les mauvaises herbes. Screenie voters, roll up your ballots and toke a fatty. Some members of the Academy must have been blintzed while casting their votes their year. What were they smoking? Bad Seeds (Les mauvaises herbes) is more or less decent as far as commercial Quebecois comedies go, but it’s ludicrous to think that this middlebrow buddy comedy/stoner flick has four Screenie nominations including Best Picture when the likes of Window Horses and Nelly have table scraps. There’s a lot of potential in Bad Seeds and it goes to little use, much like an underachiever loaded with a few grams of Pontiac pot. The film is just too long and inconsistent to be very funny. It’s a shame that Bad Seeds isn’t better because it opens with a great introduction that almost makes the film seem like Quebec’s answer to Birdman. The film begins with hack actor Jacques (Alexis Martin) performing a stuffy play in Renaissance clothing—not the kind of thing that really thrills a crowd these days. As he stares into the bored audience and watches the young attendees snore or amuse themselves with mobile devices, he realises it’s all for nothing. Then, in a moment of Iñárritu-like, Lubezki-esque wonder, the camera follows him out through the theatre and into the street in a jazzy point of view long take complete with rocking drums and a fiery ’tude. But once some bookies chase Jacques off a scaffold and into a dumpster, Bad Seeds just gives up and coasts until the final credits roll. Jacques then finds himself in a fish out of water scenario that’s good only for a few laughs when he stumbles into a Podunk town and takes shelter in the home of the local pot dealer. 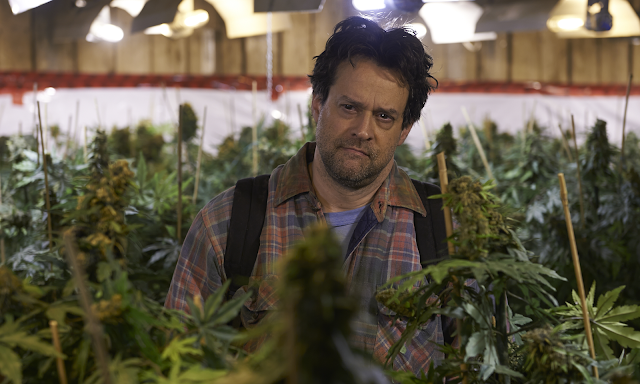 Said weed man, Simon (Gilles Renaud), is a friendly if feisty chap who quickly gets the upper hand on his lodger and uses Jacques’ need to hide as an advantage to get the actor to assist with the upcoming pot harvest. They gain a third hand when Simon abducts an unsuspecting Hydro Quebec employee (Emmanuelle Lussier Martinez from Those Who Make Revolution Halfway Only Dig Their Own Graves) who catches on to Simon’s rigged hydro metre. (Rookie mistake.) Three’s company once Francesca joins the merry band of ganja farmers and Bad Herbs mixes crime comedy and buddy humour as Simon teaches the trade to his apprentices/hostages. The performances from Martin, Renaud and Martinez are all that keep Bad Seeds going. Problems with tone and pacing deflate most of the gas from this comedy, and nothing in the film matches the panache of its opening number. Despite the great sense of place and the appreciable challenge to images of milquetoast Canada, this Quebecois comedy provides only a minor buzz. Bad Seeds is now on home video.